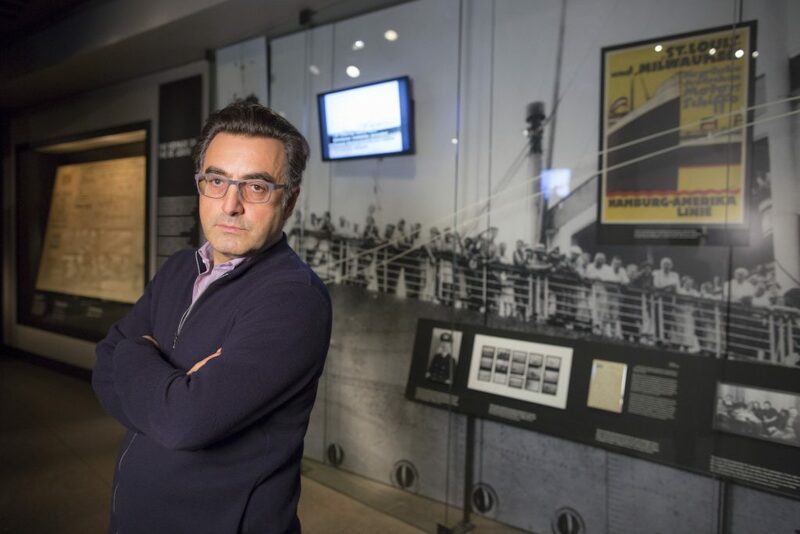 Maziar Bahari seems an unlikely champion of the Jewish people. The Iranian-born Muslim journalist and film maker, who emigrated to Canada when he was 21, has become one of the most pro-Jewish activists on the human rights stage. Bahari was a journalist for Newsweek in Iran covering the Green Revolution in 2009 when he was arrested and imprisoned for 118 days. He was interrogated by the Revolutionary Guards about his 1994 Holocaust documentary, “The Voyage of the St. Louis,” his statements against Holocaust denial and his Jewish connections. His experience in prison, 107 days of which were spent in solitary confinement, was the basis of his best seller memoir, Then They Came for Me. Since his release, Bahari has dedicated his life to raising awareness of anti-Semitism and human rights violations in Iran and elsewhere. Bahari’s films have won several awards and nominations, and his partnership with the U. S. Holocaust Memorial Museum has produced documentaries that instruct and inspire. In an exclusive interview with Hamodia, Bahari speaks about his life’s work on educating others about the dangers of bigotry and anti-Semitism. Growing up in a Jewish neighborhood in Iran, how did your early exposure to Jews influence your attitude towards them? I grew up in a Jewish neighborhood until I was around nine years old. That was before the revolution, when there were 80,000 Jews in Iran. Now there are 40,000 Jews there. I somehow understood my own identity through knowing that there are other people who are not like us. They wear a kippah, go to certain schools and use certain butcheries. During the 1980’s, Iran was synonymous with mass executions, torture, and the war with Iraq. It was imperative for the Islamic regime to attempt to force Iranians to become followers of the Ayatollah blindly, and Iranians could be punished for any attempt to diverge from that path. During my teenage years, the most important challenge was to keep our individuality intact, act our age and protect ourselves from becoming one of “them.” I played football with the Jewish kids. Mingling with Jews and other minorities were acts of resistance. What led you to become involved in the fight against anti-Semitism and Holocaust awareness? When I immigrated to Canada as a refugee in 1988, I thought I arrived in utopia. But it was in Canada that I saw and experienced prejudice as a foreigner and learned about anti-Semitism. Even during the worst years of Khomeini’s dictatorship in the 1980’s, I never heard an anti-Semitic sentiment expressed by an ordinary Iranian. Iranian state TV was saturated with anti-Israel propaganda, but it sounded forced and disingenuous. But the anti-Semitic slurs I heard in Canada reminded me of what I had read in books about the Nazi era. Many people blamed the Jews for all the economic problems Canada was experiencing in the 1980’s. While I was at McGill University I learned of its anti-Semitic history and how it imposed strict quotas on Jewish students from 1920 until 1960. I wanted to learn more about this dark past. All of this, combined with the fact that I was a refugee, led me to make my first documentary, The Voyage of the St. Louis, about Jews trying to flee Nazi terror. What kind of impact did this documentary have? I made the St. Louis film in 1994. It was shown in different countries around the world and whenever I was interviewed about the film I mentioned my reasons for making it. That came back to haunt me when I was in the Iranian prison fifteen years later. In 1997, I worked as a journalist in Iran. I wrote articles for Newsweek and produced documentaries, both critical of Mahmoud Ahmadinejad. I was interrogated between 1997-2009 almost every month by Iran’s Ministry of Intelligence about my writings and films. Sometimes they would revoke my press card for a few months and remind me that they knew where I lived. During the interrogations I received many warnings, but I was almost always warned about having any Israeli contacts or traveling to Israel. How do you view the Iran-Israel relationship based on your own experience? It is important to discuss the Iran-Israel relationship because we commemorate the victims of the Holocaust who died because of anti-Semitism, and when the Iranian regime denounces anti-Zionism, it is just a cover for their anti-Semitism. Iranian officials and many ordinary Iranians know that Iran and Israel are natural allies in the Middle East. They have historical bonds that go back 2,500 years to the time when Cyrus the Great provided refuge for the Hebrew people fleeing Babylon. Cyrus’s name is repeated 23 times in Tanach. The animosity Iran shows towards Israel is a misguided, dangerous and destructive attempt by the Iranian regime to legitimize itself, find allies among other Middle Eastern countries and expand its influence in the region. When I was arrested by the Revolutionary Guards in 2009, I was charged with undermining the security of the nation. I spent 118 days in prison, 107 of those in solitary confinement. My interrogators were fascinated with Israel and Jews. I already knew the Iranian regime was obsessed with both hating and envying Israel. But intense interrogations about my friendship with Jews and my work on the Holocaust showed me the real depth of the Revolutionary Guards’ obsession with Jews and Israel. What affected you the most during your prison term and what gave you the power to persevere? I realized how little time we have in life because when you’re in a notorious prison, where many innocent persons have lost their lives, you think that you can easily become one of them. And you go back through your life and you see what you could have done but didn’t. So it gives you a different perspective of life and time. I think what pulled me through were people who cared about me and the amazing campaign staged by my family, friends and colleagues. I was also very lucky that I was working for a foreign organization and had name recognition. The majority of prisoners aren’t that lucky. So I see it as my duty to help those languishing in jail in Iran and other countries. How did the prison experience influence your humanitarian outlook? Since my release from prison I have been on a journey during which I have made new friends and have revealed my life not only as a journalist and film maker but also as an activist. When we’re surrounded by hate, we need to raise awareness about the bigotry and prejudice that are destroying generations of young people in the Middle East and around the world. It’s been eight years since my captors did their best to silence me, and I’ve done my best to be as outspoken as I can. In what way does your focus on anti-Semitism from the viewpoint of a non-Jew distinguish you? I don’t think of myself as someone who should be distinguished from others, but I believe in equality of people and the fact that bigotry not only hurts minorities but society in general. I have a very a pragmatic view. Take Nazi Germany, for example. When you think about the contributions of Jews to German society and to the world as a whole, you think about what those Jews could have achieved had they not been persecuted and murdered in all those countries. Iran is the same thing. Iranian Jews, as well as Christians and Zoroastrians, are second-class citizens. I am trying to inform the Iranian government that they’re not only hurting those groups but hurting themselves as a nation in the long term. But anti-Semitism is deeply entrenched in the Muslim world. Do you think it’s realistic to expect their countries to change their attitude without changing their culture of hate? It’s possible, but it’s not possible to do it tomorrow. You need persistence, consistence, education and dialogue with people who might agree with you on only 1-5% of issues. But you have to start that dialogue somewhere. Can you talk about your work with the Holocaust Museum and what you hope to achieve through it? I try to use my expertise as a journalist and filmmaker to translate the museum’s vision into films, documentaries and speeches for the public. Every visit horrifies me with the precision with which the Nazis killed 6 million Jews. And the world allowed it to happen. I believe it’s important to find new and creative ways to fight anti-Semites because of the disturbing anti-Semitic movements surrounding us. We simply cannot be silent. I worked on two short films. One was about Abdol Hossein Sardari, the Iranian diplomat in Paris who helped hundreds of Iranian and non-Iranian Jews during the Holocaust. The other was about the Holocaust and Holocaust denial for Iranian audiences. My forthcoming documentary, 82 Names, tells the story of Mansour Omari, a human rights activist who survived imprisonment and torture by the Assad regime in Syria. The museum is running a special exhibition focusing on the dire situation facing Syrian civilians. But the Syrian civil war is a political conflict. Do you think that piggybacking on the Holocaust diminishes from the horror of systematically singling out a people for annihilation because of their religion? I don’t think piggybacking is the right word. I think learning from the lessons of the Holocaust doesn’t mean that we are exploiting it. We are not diminishing from the Holocaust or suggesting that it is similar to what is happening in Syria. All these tragedies are different. The Holocaust is different in terms of the magnitude, the bureaucracy, the ideology, and the inaction of the world community. But I think there are lessons to be learned about hatred and the role of propaganda. Look at Iranian propaganda now. Many people have a very superficial understanding of the Holocaust. They think that the Nazis woke up one day and killed 6 million Jews within a couple of years. It wasn’t like that. It was a culture that existed. Can you describe the online platform IranWire, which you founded? I started IranWire in 2013 as an online platform for Iranian citizens to share information, both in English and Persian. When I came out of prison, I realized that there are many people who are very active and risking their lives to put out their content, but it wasn’t always good. So I thought it would be a good idea to create a forum where they can be in touch with professional journalists, learn from them and publish good quality content. We’ve since been able to mentor more than 900 journalists. I think I have a much better understanding of the cost of discrimination and bigotry. What I and others do can never change the world, but we have to be part of a larger movement. If I can change the mind of even one Iranian official then I will have succeeded.